Dave Innes has joined Kube Solutions as our new Technical Sales Manager. On January 21st, we were honoured to have the Premier of Nova Scotia, Darrell Dexter, visit our Dartmouth office. The Grand Slam of Curling is Back! This National event is currently taking place at the Port Hawkesbury Civic Centre from January 23 to the 27th. KUBE Solutions is excited to announce that the HVAC Kube has been approved by Efficiency Nova Scotia’s Business Energy Rebate Program. On November 21, 2012, Kube Solutions was pleased to participate in both the conference and tradeshow focused on advancing the design, construction, and operation of greener buildings in Atlantic Canada. Kube was delighted to be a participant in the Bright Business Energy Efficiency Conference on October 24th. Atlantica Mechanical will be our authorized Service Provider for start-up, service, repairs, maintenance, and warranty requirements for the Kube Products. As well, they will be manufacturing, testing, and commissioning the Kube products. The KUBE team is excited to be exhibiting in these up and coming trade shows. Check out the list below as we are looking forward to connecting with you during these events! 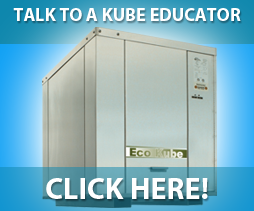 Kube Solutions, formerly Ice Kube Systems, has been manufacturing heat pumps for use in the Geothermal industry since 1995. Its superior patented products and technologies have made Kube Solutions the leading provider of modular geothermal and environmental commercial HVAC systems, heating & cooling solutions, heat pumps and air conditioning in Atlantic Canada. © 2019 Kube. All Rights Reserved – Commercial HVAC l Heating & Cooling Systems l Heat Pumps l Air Conditioning.